Propeller 5 bladed by ReneeCelDesign is licensed under the Creative Commons - Attribution - Share Alike license. This is a 84mm diameter 5 bladed propeller designed to fit a 3mm shaft. It is counter rotating and produces thrust away from the motor, so is intended to be fitted to the back of an item to be pushed. 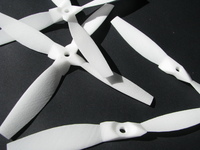 The propeller weights 3.5grams and at an RPM of aprox 20,000 produces 82 grams of thrust. Say thanks by giving ReneeCelDesign a tip and help them continue to share amazing Things with the Thingiverse community. Say thanks and help ReneeCelDesign continue to share amazing Things with the Thingiverse community. You'll need a PayPal account to tip ReneeCelDesign. Click the button below and you will be redirected to PayPal. Once the payment is complete, you'll be brought back to Thingiverse.